Today’s guest is Erin Bahadur, from Erin’s Inside Job. 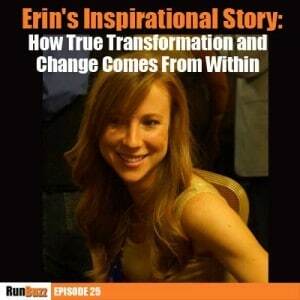 Erin is a health, fitness, and food blogger and an aspiring fitness trainer. She has an amazing and inspirational running story to share with us about her personal path to the sport. What makes Erin’s story so incredible is how she overcome a drug addiction that started in college. She now uses her health and fitness blog, not only to help maintain her positive changes, but also as a tool to reach out to others who may be struggling with similar issues that she experienced. Unfortunately, many stories of addiction do not have a happy ending. What Erin has done is simply inspirational and can help others push through their own difficult times. Aside from her incredible personal feats, Erin is your typical runner. She isn’t a pro athlete or overwhelmingly fast. Instead, when it comes to her abilities, like many of us, she’s just an average runner. Despite this, what she shares with us is not only inspirational, it challenges you. Erin shows us that, while life is more than just running, sometimes running changes lives. Erin’s recent move to Chicago to become a certified fitness trainer to help others live healthier lifestyles. How she changed her mindset and life through realizing that true transformation, true happiness, and true contentment comes from the inside, not the outside. How the unhealthy desire to be a better runner led to injury, and then how she changed that course to actually become a better runner. Erin’s Advice For Runners: Progress, not perfection! Erin’s Advice For Runners: Comparison is the thief of joy! Erin’s # tip for someone who struggles with addiction: Reaching out for help and not keeping it to yourself.